Our Amish Made Vineyard Nightstand has a classic Mission style that will make the perfect, simplistic statement on your bedroom decor! With the flush mount drawer fronts, beveled edge top and raise panels, this nightstand has a modern flair with Early American influence that will remain stylish for generations. 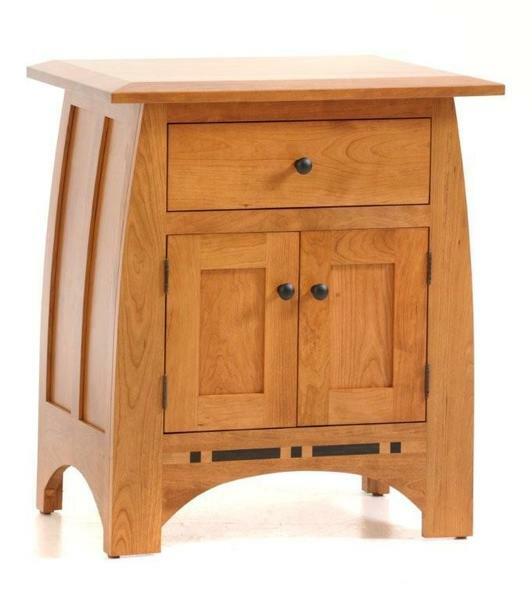 Our 28" Vineyard Nightstand is crafted with one fully-extending drawer and a large cabinet covered by two raised panel doors, so you will be sure to have ample space for all of your bedside items. Along with the flat panel drawer fronts that display the grain of the hardwood, each piece features a beautiful ebony inlay that serves as a bold and elegant accent piece. With the optional soft close drawer slides and the cedar drawer bottoms, your new nightstands will be unrivaled in function and beauty. I wanted to let you know that our furniture was delivered today and it is absolutely gorgeous. Their workmanship is excellent. Gary and Bill who delivered it were terrific very nice and friendly and they did a great job. Thank you for all your help as well, you guys are great. It was a pleasure doing business with you and your group.